Do not ignore air filter if you are to keep your vehicle running for a long time. Dust is everywhere. It is on the road, in the house and on the roof, on billboards, and of course on cars. Everything is covered in dust and to everybody flue and sneezing is not a surprise. Sadly, when you look at the sky, there is no sign that even out of the blue it will rain. Since most roads are almost marrum, by around midday the whole sky and horizon is covered with dust. Water consumption is very as thirsty everyone tries to quench the thirst. But it is not only humans that are affected by the dust. Vehicles too are finding a lot of the problems. Many motorists are experiencing challenges with their vehicles that they do not know and some mechanics are also really challenged by the problems and are unable to help. Some of these problems are related to the vehicle filters. Vehicle filters are one of the most neglected maintenance items in a motor vehicle. Why? Well, most of the time the filter are enclosed and thus, out of sight out of mind’ comes into play. A good mechanic will inspect all vehicle filters during service regularly for you and let you be informed when they need to be changed. Why change them and if so will it make a difference? Most of the time when you change a filter you will not feel any difference. However, if you do not then you will feel a difference and end up having to replace something other than a filter. If you are driver or vehicle owner, it is likely you do not keep up with your vehicle’s maintenance like you should. When buying the car, the owner’s manual probably includes a maintenance schedule. This undoubtedly outlines several types of service to be managed every few months or so, such as an oil change and tire rotation. The air filter for your vehicle helps to clean the air from the atmosphere to the engine. The air cleaner facilitates your vehicles operation by trapping small particles of litter or debris, such as sand or dust that can quickly build up choking the air flow and slowing the engine’s performance. Air filters also helps to provide cleaner air also to the inside your vehicle too so that you do not start hacking and coughing when breathing the dust kicked up by your vehicle while traveling on an unpaved up country roads. 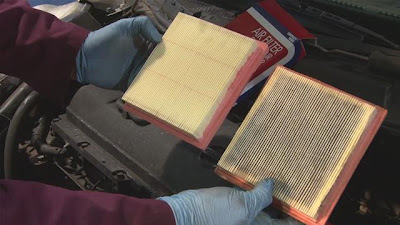 If you are not sure when to change the air filter ask an automobile technician. For trained technician he or she will probably inspect yours when performing the routine oil change but not an annual general checkup. Air filter replacement does not need to be done more than twice or thrice a year but this will greatly depend on your driving habits, how often you service your vehicle and the road conditions. The good thing is air filters are not very expensive; their price in turn saves you from high fuel consumption for the easy flow of clean air to the engine. Vehicle owners who live in rural areas and drive on dusty roads, muddy fields or streams, and anyone who drives in sandy soil or weather conditions that are chronically adverse may need to change their air filters more often than drivers who drive paved roads. Air filters are of various types. The paper element type and the oil bath type but the paper element type of filter is the most common type because it is simple in construction and cheap to manufacture that makes them very popular. Do not ignore air filter if you are to protect your vehicle engine and keep it running for a long time. Your vehicle’s service life greatly depends on the air filter.